The original Goldendoodle was a hybrid cross of a Golden Retriever and a Poodle. The exact date of conception is unknown as a handful of breeders emerged in the late 1990’s marketing this new breed. 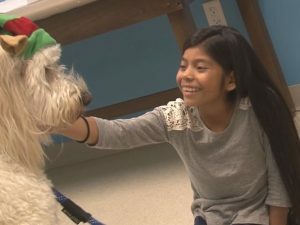 The idea was no doubt inspired by the creation of the Labradoodle and its success as a compatible dog for many people who experience mild allergies to dogs. The gorgeous low to no shedding coats were attracting those who loved the temperament of the Golden Retriever, but detested the amount of hair left behind and/or the allergy issues it presented. Thus, the Goldendoodle became a universal hit! As the breed continued to develop, requests for different sizes became common and breeders answered. The public’s immediate adoration of the standard Goldendoodle (a standard Poodle crossed with a Golden Retriever) led the breed originators to look at size variations to accommodate different lifestyles. There are now four categories for sizes – petite, mini, medium, and standard. They also come in a variety of colors and coat patterns. (See the breakdown on the Colors, Coats and Sizes page within this site). Goldendoodles are extremely social, outgoing, non-aggressive dogs that thrive on human companionship. They have a great desire to please and to learn. Each individual breed (the Poodle and the Golden Retriever) score in the top 4 of the 150 smartest dog breeds. They are incredibly intelligent and eager to please. 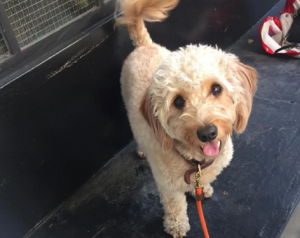 Coupled with the low to non-shedding coats, this temperament has proven to make Goldendoodles perfect candidates for service work as well as family pets. Did we mention “Hybrid Vigor”? Hybrid vigor, the increased health benefits of crossing two completely unrelated breeds, gives the Goldendoodle the health and vitality that makes them, on average, outlive either one of their parent breeds. It should be stressed, however, that the general health and vitality is enhanced dramatically when parents have been genetically tested for the inherited diseases that both parent breeds share in common. Given their wonderful disposition, intelligence, health and low to no shed coats, it’s no wonder why Goldendoodles are ever increasing in popularity. While this is a wonderful thing for the breed in general, it’s GANA’s mission to make sure we only allow dogs who have passed all of the health testing to be a part of the next generation. GANA’s primary objective is to promote and guide the development of the Goldendoodle and to achieve breed standards while maintaining optimum health. GANA guides breeders to the common goal of establishing reliability in coat type, health, and temperament.